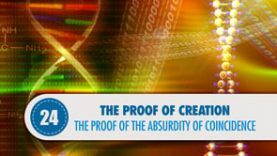 In this proof, we will provide examples regarding the universe not being a result of coincidences and expose the absurdity behind the phrase, “the universe formed by coincidence”. We are going to Liverpool from London. We set off from London and arrive at “Town A”. We choose one out of the two paths on our way. Our choice is correct. We arrive at “Town B”. From there, three roads emerge. We choose one at random and arrive at “Town C”. And there, four more paths emerge. At last, we arrive at the path that is closest to Liverpool; however, 1,000 paths now stand before us. Once again, we randomly choose “path number 375” and reach our destination. Can this explanation be explained as a “coincidence”? Even if it were accepted that we arrived at Liverpool by coincidence, our constant success in finding the right way every time we encountered thousands of paths, would be attributed to a guide showing us the way in every situation. An atom’s activity is not different from our activity mentioned in the example. It has billions of paths to choose from yet it chooses the best one. A creature’s body is the result of an atom finding the best way out of these billions of possibilities. An atom choosing the best option out of billions can only occur with the command of one who is prudent and the preference of a decision-maker. It cannot be any other way. Oh the person who denies God! Listen; While you do not accept that a person can coincidentally choose the correct path out of many options on a journey to Liverpool, how is it that you are able to accept that unconscious and mindless atoms are able to find the most suitable path out of billions of options? And, how is it that you are able to attribute creation to the coincidental decisions made by atoms? Could a person who accepts this be considered smart? The probability of a die rolling the numbers 1, 2, 3, 4, 5, and 6 in consecutive order is (1/6)6, that is to say 1 in 46.656. The number of bones in a person’s ear is six. Even if the appearance of these six bones is accepted as a coincidence, the probability of these bones aligning in their present order is 1 out of 46.656. This is just the probability of one person’s ear-bones aligning by coincidence. Think of the same alignment for each one of the 7 billions people in the world. The one who denies God should look at what they are obliged to accept and be embarrassed by this! If we were to roll the die again, the odds of rolling a four are 1 out of 6. If we were to roll two dice at the same time, the probability of rolling a four for both is 1 out of 36. The odds of having both dice roll fours in two sets both times are 1 out of 1,296. The odds of having both dice roll fours after the dice are consecutively tossed four times are 1 out of 1,679,616. If the probability of rolling ‘4’ four times on end when you throw two dice is 1 out of 1,679,616, then what are the chances of the 206 bones found in the human body being suitable for one another? Let us suppose that all bones were created by coincidence and that we took these bones and put them in a bag. Every time we pulled a bone out of the bag, we tried to align it to the skeleton’s arrangement. When we pulled a wrong bone out of the bag, we placed the other bones that were picked and fitted correctly till then back into the bag and started over. What are the odds of correctly picking 206 bones? Such a number cannot even be expressed in trillions. Do not forget that we made this account by accepting that the bones had been created by coincidence. What kind of account could be made for the probability of the bones being created by a coincidence? What if an additional account was made, not just for the bones found in people, but for all people sharing the same bone structure made from the same mineral, and what if animals were added to this account? Could a probability be accounted and could these numbers be expressed? Oh, the person who denies God! Look at what kind of probability you will be obliged to accept by denying God, and if you have not completely lost your mind, then, give up this thought! Now let us think of the Mosque of Hagia Sophia having been created from natural events on its own without an architect. A gust of wind from the west brings 11.5 tons of lime and another wind from the east brings 2.37 tons of brick. A wind from the southeast brings 4.3 tons of iron. A wind blowing from the north brings 10.7 tons of water and pours it here. A wind comes from another direction to arrange these bricks. Another wind puts the cement in place and this is how the Hagia Sophia comes into being. There is probably not a more logical explanation than this when we deny the Hagia Sophia’s architect and attribute its construction to coincidence. Now let us compare the mosque to our cells. This mosque is 1200 square meters while our cells are 5-10 microns. Five to ten materials are needed for this mosque whereas 30,000 components are needed for our cells. The weights of materials that are needed for this mosque are expressed in kilos and tons whereas the substances in cells are sensitive enough to be expressed in micrograms. If a change about the size of a molecule occurs, then, the cell will be destroyed. O, the person who denies God! Listen: while you are not able to accept that a mosque can come into being by itself and laugh at the idea, how is it that you deem a stranger impossibility of a cell forming by itself possible? Let us place a monkey in front of a typewriter. Let us suppose that the monkey randomly touches the keys on the typewriter. Would it be possible for a meaningful word, sentence, or page to form? Is the composition of a meaningful book within the realms of this possibility? Definitely not! If we sat a monkey in front of the keyboard, the odds of it typing the letter “O” would be 1 out of 29. The probability of typing “OX” is 1 out of 841. For example, the odds of typing “ETERNAL” are (1/29)7, so that is 1 out of 17.249.876.309, which is impossible in terms of time. Are humans and animals not more excellent than a seven letter word? Putting living beings aside, when we look at one DNA, we can find 3.5 billion nucleotides, which are 3.5 billion letters, in just one DNA molecule. If the odds of a seven-letter word forming by coincidence are 1 out of 17.249.876.309, then what are the odds of 3.5 billion letters coincidentally forming in a single DNA? If all adequate atoms on the Earth were used, the probability of coincidentally acquiring a single protein from the time the Earth was created until the present would be 1/10161 . That is, you need to multiply ten by ten 161 times, or add 161 zeros to the right of 10. The probability of a single protein forming by itself is just one out of so many probabilities. However, it is not all. The smallest of living beings needs 238 more proteins. If you wanted to articulate the probability of so many proteins forming by coincidence,you would need to repeat the word “trillion” 9975 times, which would take about 2 hours of your time, and then multiply the resulted number with 10. The probability of a living being’s proteins forming by coincidence is just one out of so many probabilities. Then, would the intelligence of the one who claims that this universe came into existence through coincidence not be doubted?